aneurysms that are not amenable to treatment with surgical clipping and are attached to parent vessels measuring 2.5 to 5.0 mm in diameter. “These types of aneurysms are inherently complex, and have a higher risk of bleeding, as well as higher rates of complication with conventional treatments. With thousands of patients now treated successfully, this advance will lead to improved treatment and care of patients with brain aneurysms," says David Altschul, MD, neurosurgeon with Montefiore's Neurovascular Program. 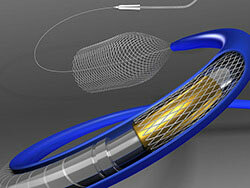 The flexible mesh braided cylindrical tube is implanted across the base or neck of the aneurysm and cuts off the flow of blood to the aneurysm, reconstructing the diseased section of the parent vessel. Montefiore provides a multi-disciplinary approach to treating aneurysm and the PipelineTM Flex embolization device is one of the options we can provide. Click here for more patient information, or watch a PipelineTM animation.